Stephen R. Covey (born October 24 1932 in Salt Lake City, Utah) is the author of the bestselling book, The Seven Habits of Highly Effective People, as well as other books (First Things First, Principle -Centered Leadership). He is the founder of the Covey Leadership Center in Salt Lake City, Utah, and is the "Covey" of the Franklin-Covey Corporation, which makes planners and organizers and does management consulting. He has his BS in Business Administration from University of Utah in Salt Lake City, his MBA in Business Administration from Harvard University, and his DRE in Church History and Doctorate from Brigham Young University. Follow-up titles to The Seven Habits are meant to both add to the original and form a cohesive philosophy on personal, principle-based leadership. They are available as audio books as well. 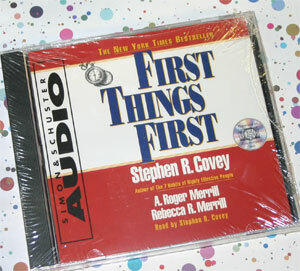 Covey has also written a number of learning books for children. Covey's aim is to help others gain proficiency in their lives, especially within the context of business and management and make money doing it. However, his books also emphasize family and personal leadership. They are marketed to a wide-ranging audience, from high-powered executives to stay-at-home mums. Similar authors might include Peter Drucker or David Allen, as well as other more business-centered writers. Covey's works also exhibit a central philosophical ideal, which some would interpret as right of center or conservative, although he was for a time a consultant to President Bill Clinton. Critics of Covey's methods contend that the author offers a "quick fix" that dissipates when measured against the reality of day-to-day life. When confronted with situations that contain elements that are outside the realm of their personal influence, those imbued with Covey's summary accountability can become frustrated at the "habits'" failure to place situations within their locus of control. In short, Covey is sometimes said to preach impractical, idealistic methods. Advocates of Covey's methods point out that the author consistently opposes "quick-fix" solutions to life or business problems and insists that changes in paradigm or mindset to align with natural principles are the true source of solutions. Covey points out, for example, that the paradigm that produces short-term results in business inevitably leads to an inability to produce results for the long term. He calls this "killing the golden goose." The most effective mindset for the business person is to balance short- and long-term productive capacities.